This section contains information specific to different hardware products and accessories. This includes information on modules and actuators, mechanical and electical accessories, robot kits, and details of any hardware-specific parameters for the APIs. 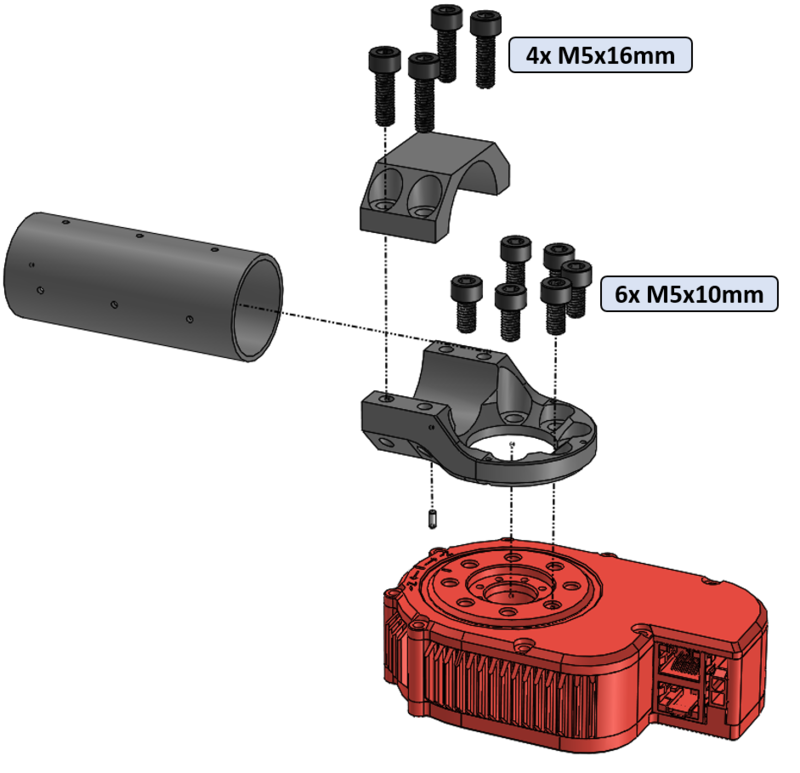 CAD files of the actuators and accessories are available at cad.hebi.us. 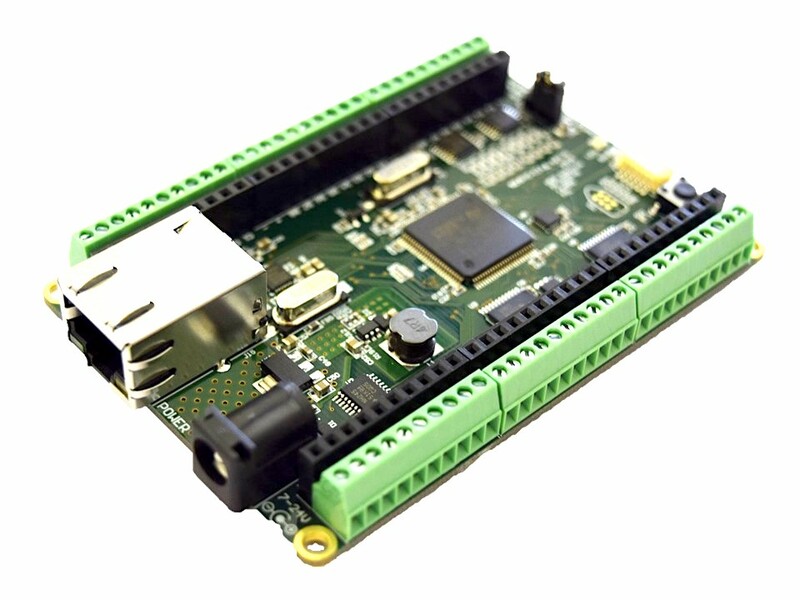 HEBI modules are ethernet-enabled devices that serve as building blocks for a robot or automated system. These modules include actuators to provide physical motion, and devices to interface with other sensors and I/O. 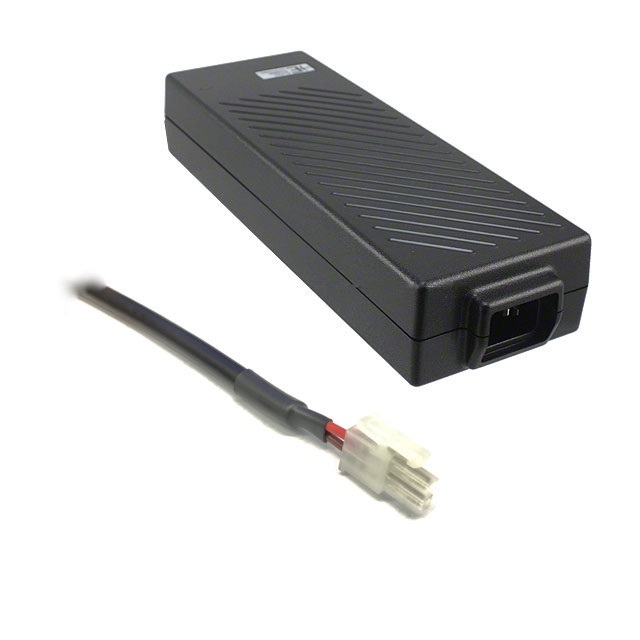 Modules run firmware that allow them to communicate over a standard ethernet connection. Aspects of the firmware that are common to all modules are documented in Core Concepts, while aspects that are module-specific are documented below. The X-Series Actuators are 'smart' series-elastic actuators that integrate a brushless motor, geartrain, spring, encoders, and control electronics into a compact package that run on standard DC voltages and communicate using standard 10/100Mbps Ethernet. 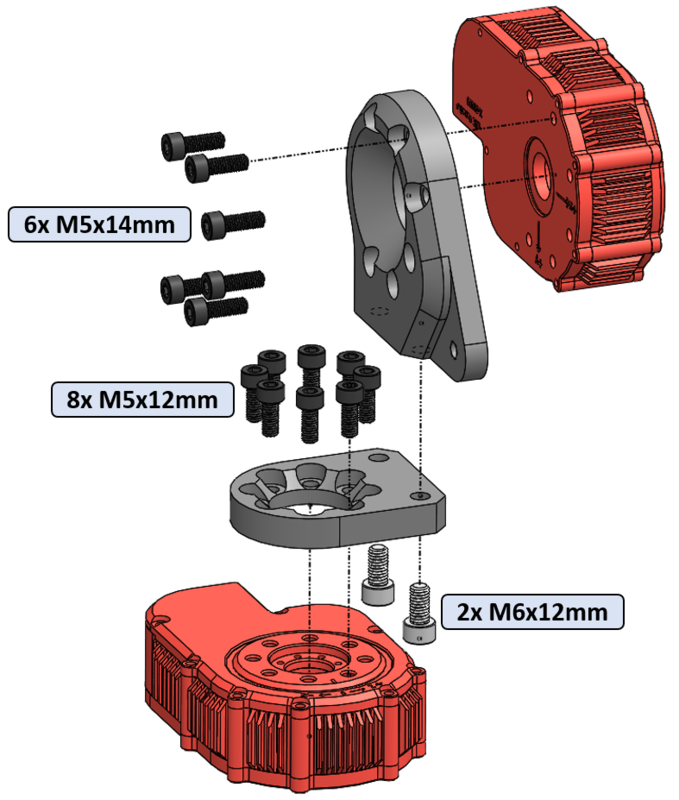 These actuators are designed to function as full-featured robotic components and enable the simultaneous control of position, velocity, and torque. 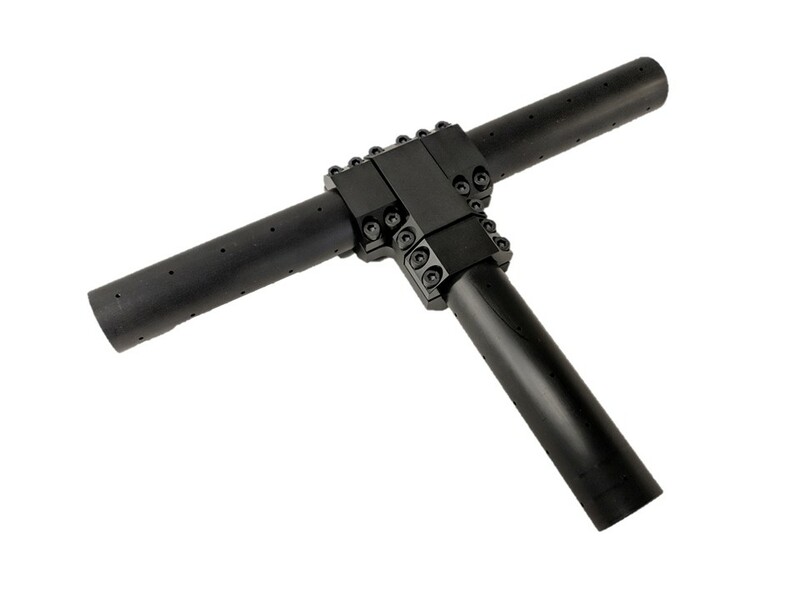 Each actuator also has a wide range of other sensors, all of which can be easily accessed in the the various APIs. 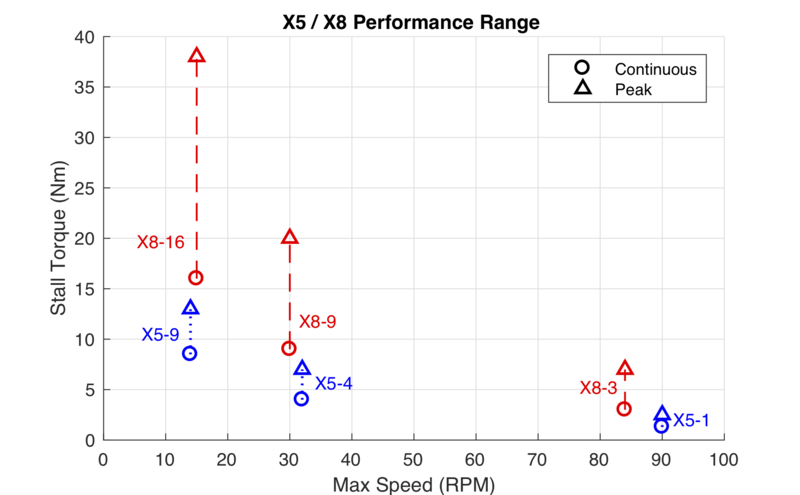 The chart below indicates, separately, the maximum no-load speed and stall torque capabilities of the different models of X-Series actuators. 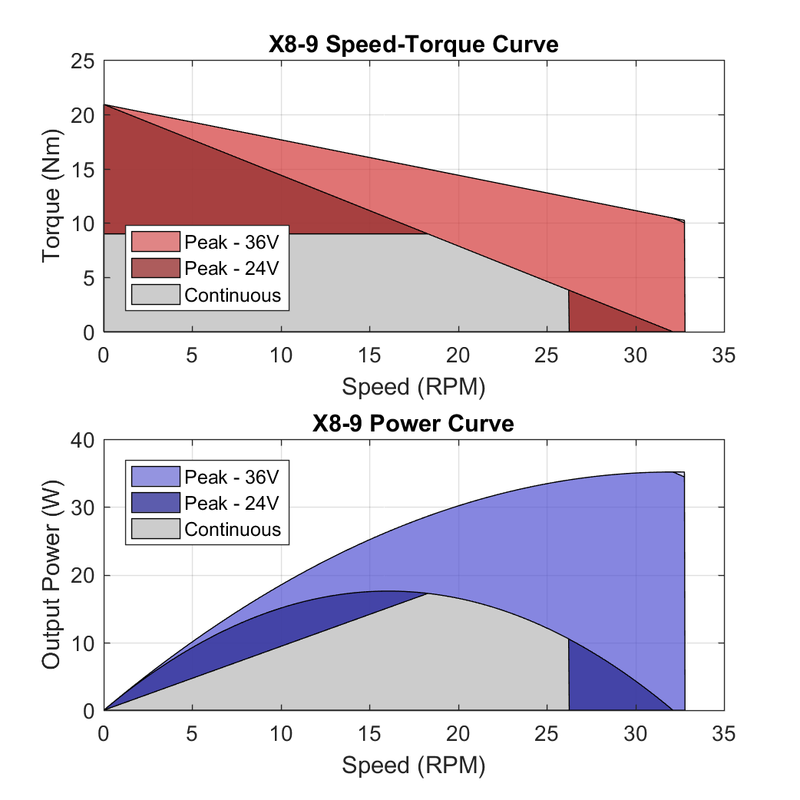 For example, an X8-9 is not capable of continuously providing 9 Nm of torque at 30 RPM. It is capable of a continously spinning at maximum speed of 30 RPM at a lower torque, and it is capable of exerting 9 Nm of torque at a lower speed. More detailed performance information for each actuator is provided in the additional sections below. Each actuator has a range where it can perform continuously, as well as a peak range where it can perform intermittently. 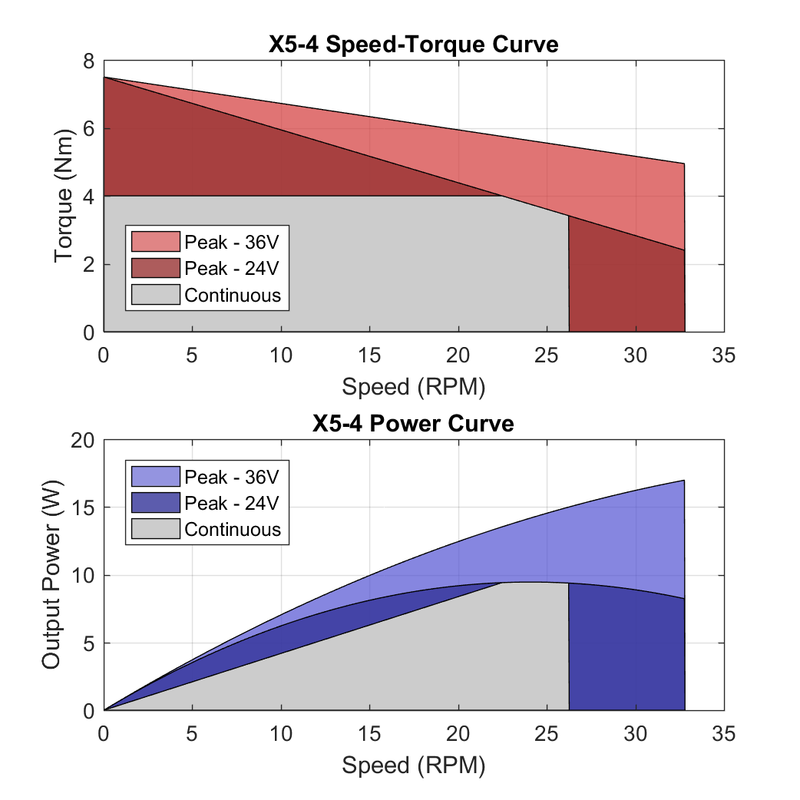 While X-Series actuators are rated running at 24V, they are capable of increased intermittent output at higher voltages. 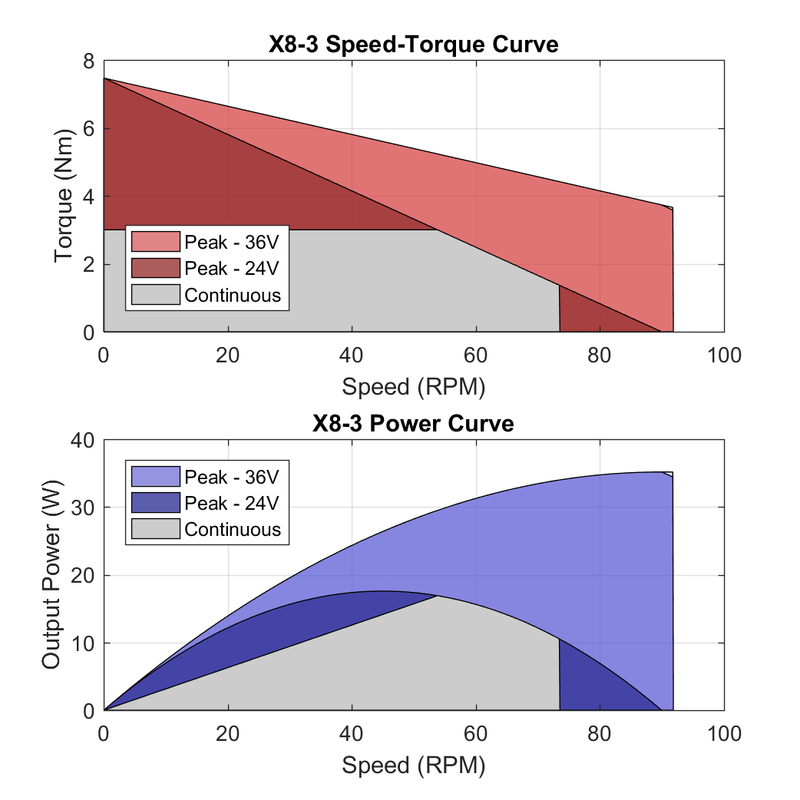 The speed-torque curves below show both the continuous and intermittent operating ranges at 24V, as well as 36V and above. While the actuators can be run at bus voltages up to 48V, the performance is limited in firmware to the equivalent to 36V, allowing safe operation while decreasing the amount of current drawn at the power bus. The ranges shown below are approximate and assume an actuator in normal room-temperature conditions without additional cooling. To view a larger version of an individual graph, right-click the image and open in a new tab. 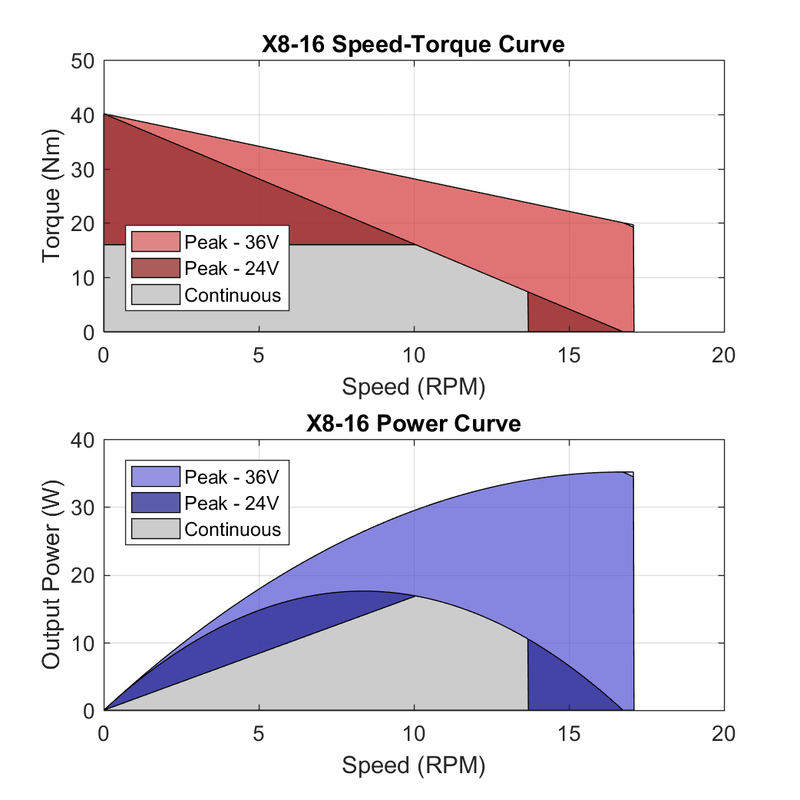 Because the X-Series actuators are mechanically compliant, there is a limit to how rapidly they can react and track to desired commands. Overall, the actuators are designed to be able to replicate human-like motion, but the details of their frequency response depends on the model of the actuator and the details of its commanded action. The plots below were generated with a mechanically fixed output and tracking a sinusoidal commanded effort of different amplitudes. 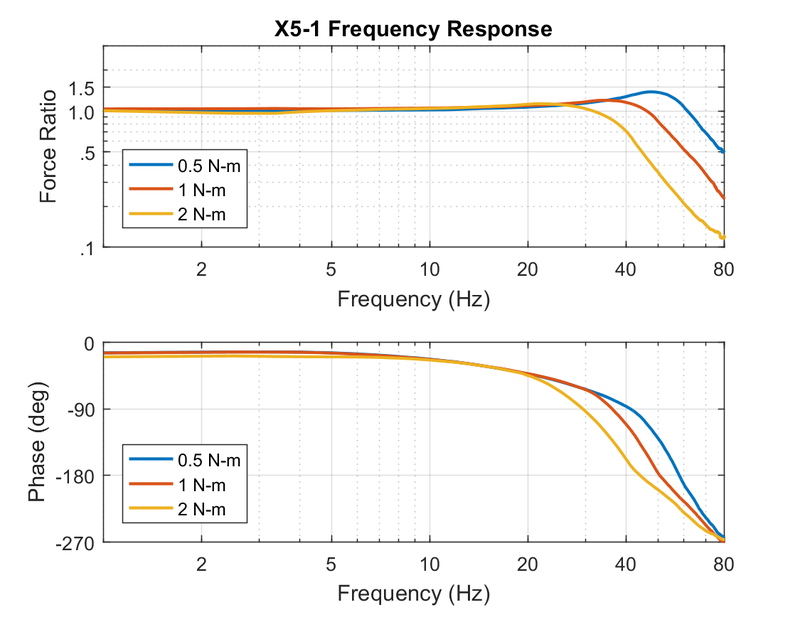 The ranges shown below are approximate and assume an actuator running at 24V in normal room-temperature conditions without additional cooling. 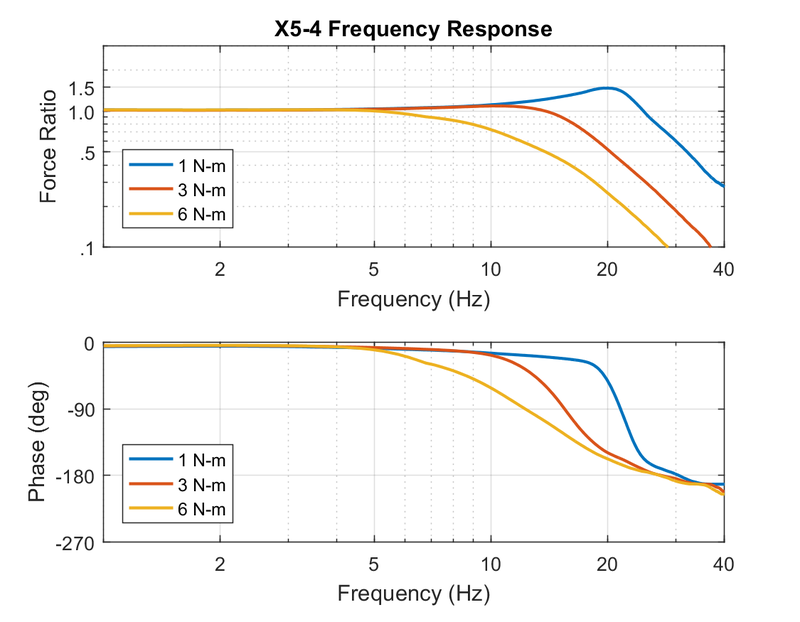 The gains that are used when controlling an actuator greatly effects the frequency response. 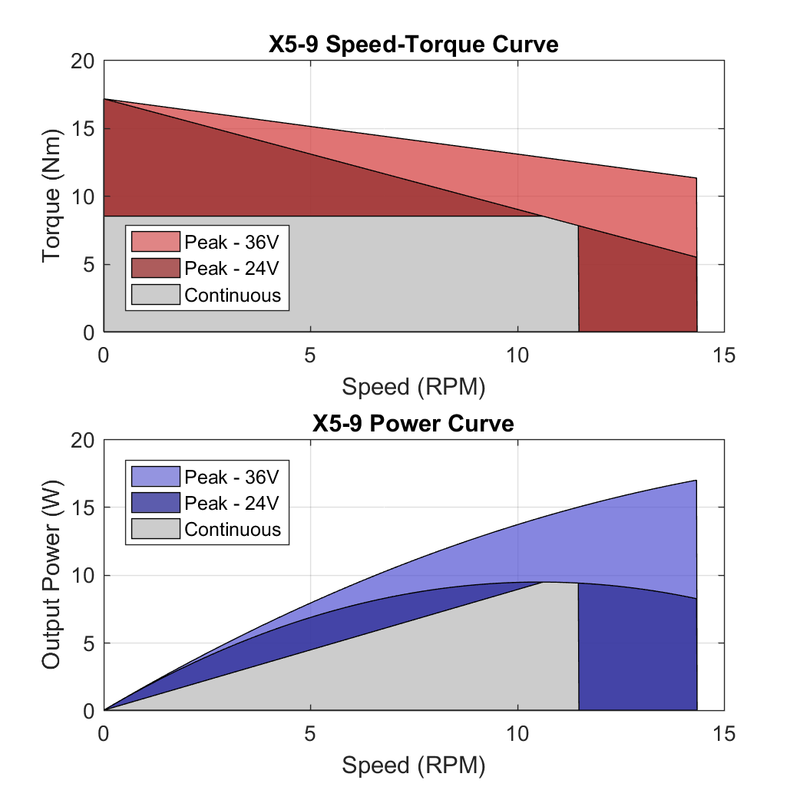 The plots below use an effort Kp approximately 2X the default value that ships with a new actuator. 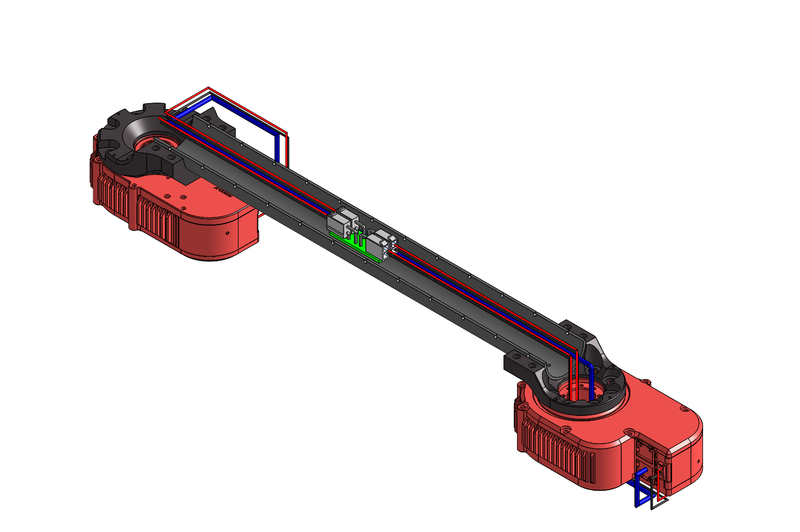 The reference frames for the X-Series Actuators are shown in the image below. The origin of the coordinate frames are on the back plane of the housing, centered on the axis of rotation. This is the frame in which the IMU feedback is reported, and it is also the frame that is used for kinematics calculations in the various APIs and the HRDF file format. 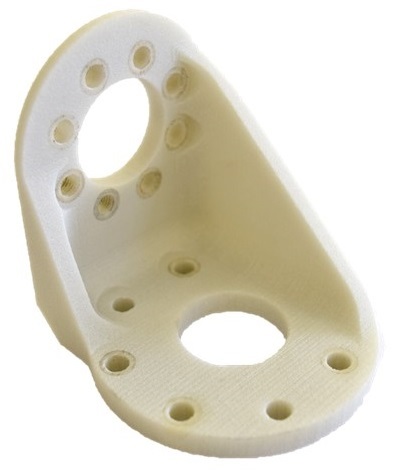 The coordinate frames are also physically engraved on the housing of each actuator. X-Series actuators provide all the feedback below when feedback is requested. Feedback can be requested at rates up to 1 kHz. Wherever possible values are in SI units. The current time from the system clock used by the API. This is a single value that corresponds to all feedback at this timestep. The system time when feedback was received by each module. The most recent of these times is what is reported as the single time above. The system time when feedback requests were sent to each module. The hardware timestamp when each module in the group transmitted its feedback. Time initializes at 0 when a module is powered on. The hardware timestamp when each module in the group received a request for feedback. Time initializes at 0 when a module is powered on. Sensed position (absolute) of the output of an actuator. Sensed velocity at the output of an actuator. Sensed force or torque (absolute) at the output of an actuator. The currently commanded position. If no position is being commanded a value of NaN is returned. The currently commanded velocity. If no velocity is being commanded a value of NaN is returned. The currently commanded effort. In control STRATEGY_2, 3 or 4, this is a commanded torque or force. In DIRECT_PWM mode, this is the commanded PWM to an actuator’s motor. If no effort is being commanded a value of NaN is returned. In control strategies 2 and 4, this is the torque or force command going to the inner torque PID loop. The currently commanded PWM being sent to an actuator’s motor, after being modified by any internal safety controllers. The internal deflection of the spring inside an actuator. This value is directly proportional to the reported torque/force in the effort feedback. The velocity of the spring deflection. 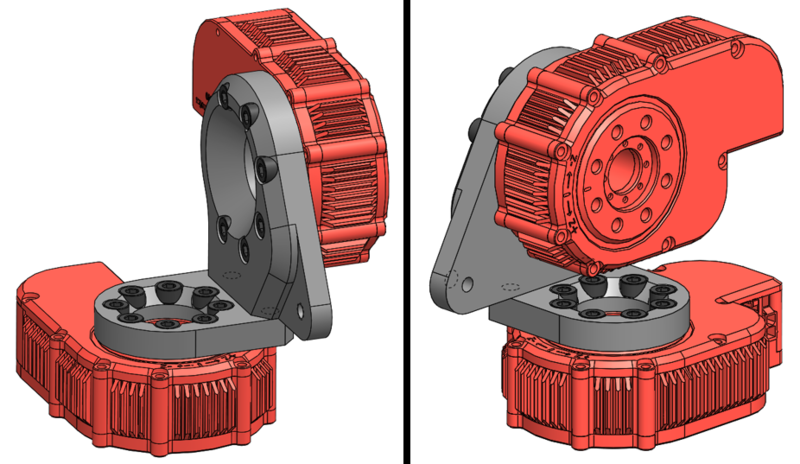 The position of an actuator’s internal motor before the gear reduction. Initializes at zero when an actuator is first powered on. The velocity an actuator’s internal motor before the gear reduction. A module’s sensed 3-DoF acceleration from an internal IMU, including gravity. Note that this is the sensed motion of the actuator body itself, not the actuator’s output. Depending on the API, XYZ values are combined together into a single vector or returned individually. A module’s sensed 3-DoF angular velocity from an internal IMU. Note that this is the sensed motion of the actuator body itself, not the actuator’s output. Depending on the API, XYZ values are combined together into a single vector or returned individually. A module’s 3-DoF orientation based on an onboard complimentary filter. The heading component of the estimated orientation will drift over time, as the filter uses only accelerometers and gyros. Depending on the API, quaternion components are combined together into a single vector or returned individually. The sensed amount of current an actuator’s motor draws at the bus voltage. 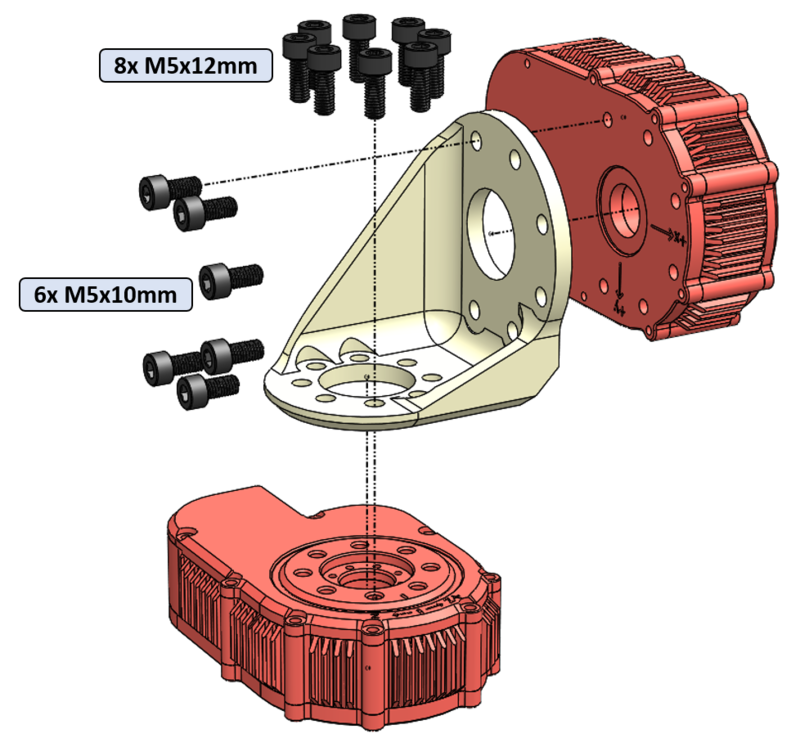 The estimated of amount current draw of the motor windings internal to the actuator. 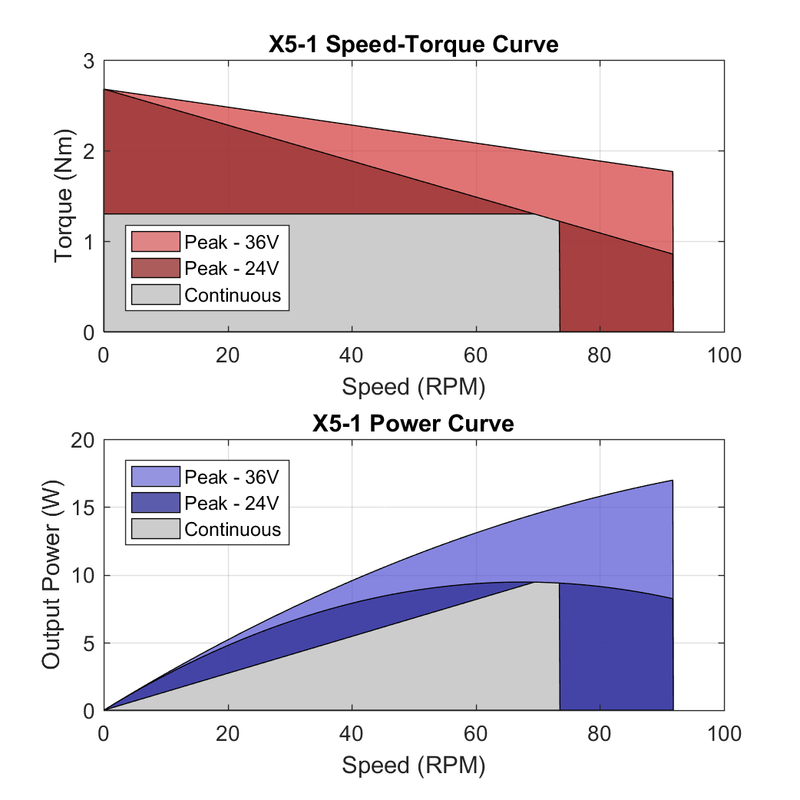 This value is modeled based on the known motor parameters, internal motor velocity, and current. The sensed bus voltage into the module. The sensed temperature near the motor in the actuator. The sensed temperature of the electronics in the actuator. The sensed temperature of the processor in the actuator. The modeled housing temperature of the motor inside an actuator. The modeled winding temperature of the motor inside an actuator. 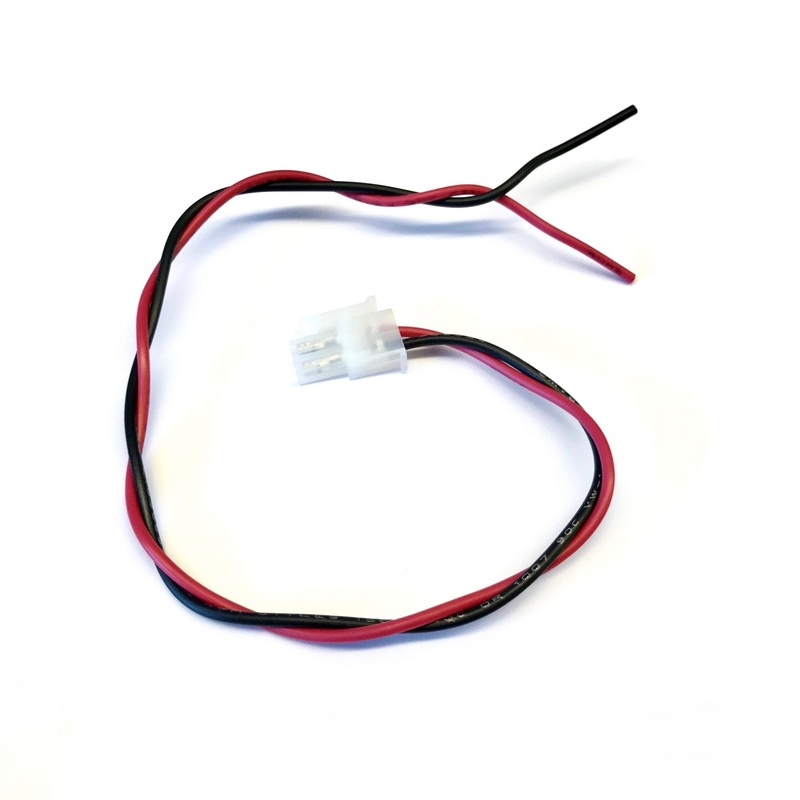 This value is used by a safety controller that runs in the firmware of an actuator that will limit the PWM to the motor if it approaches a critical temperature. RGB color values of the status LED. Depending on the API, RGB values are combined together into a single vector or returned individually. The current user-settable name that a module shows up as in a Lookup. The current user-settable family that a module shows up as in a Lookup. The MAC Address of the module. 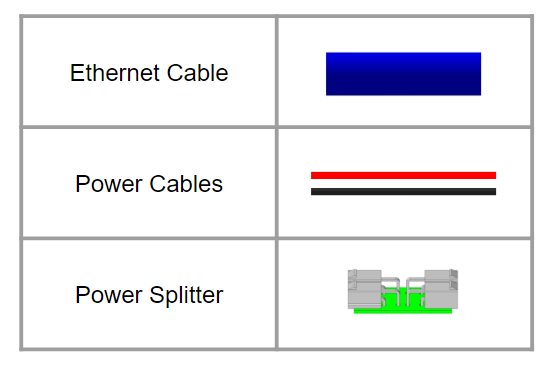 This is a unique identifier used in Ethernet communication. The IP Address of a module. The network mask of a module. The gateway of a module. The specific type of firwmare that a module is currently running. The revision number of the firmware that is a module is currently running. The unique HEBI-assigned serial number for a module. The mechanical type of an actuator, for example "X5-1" or "X8-9". The revision identifier for the mechanical components for a module. The specific type of electronics in a module. The revision identifier for the electrical components for a module. All controller parameters are settable in the API. See Core Concepts section for more information. The commands that each actuators support for controlling motion are the same as the commands listed in the Group API section of Core Concepts. They are included here for convenience. The desired position of the output of an actuator. The desired velocity of the output of an actuator. The desired torque or force of the output of an actuator. For an actuator in`DIRECT_PWM` control strategy, this will be the desired PWM of the motor, from -1 to 1. In addition to commands related to an actuator’s motion a number of other things can be commanded and/or set. The desired user-settable name that an actuator shows up as in a Lookup. The desired user-settable family that an actuator shows up as in a Lookup. Boots a module from bootloader mode into application mode. Saves all the settings and gains that are currently set on a module, so that they are loaded after reboot. Sets the current feedback position by adjusting the user-settable reference point for the zero position. This persists automatically. Sets the current feedback effort by adjusting the user-settable reference point for zero effort. This persists automatically. Override RGB color values of the status LED. 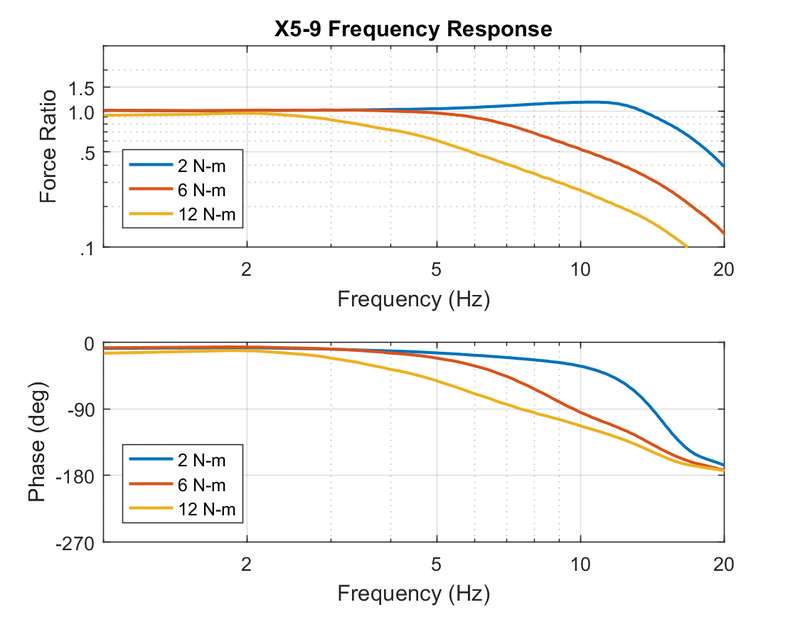 We have provided downloadable recommended default gains for all control strategies of each of our X-Series modules. Note that these gains should still be tuned for best performance depending on the particular application. The default gains provided below assume firmware v10 or higher! Using these settings on earlier firmware versions will cause poorly scaled Kd, Ki, and Feedforward gains. - All Feedforward gains that are non-zero will get changed to 1.0. - All Ki gains get multiplied by 1000. - All Kd gains get multiplied by .001. For the MATLAB API we have provided a helper function for scaling gains to firmware v10 on all the modules of a given family name, as well as a function for setting the default gains onto a group of modules. For this script to work you will need to download all the individual gain XML files from the table below. You will also need at least the 1.0 version of the Matlab API. For the C++ API there is a code snippet in the API documentation that shows how to iterate through a group of modules and scale the gains. 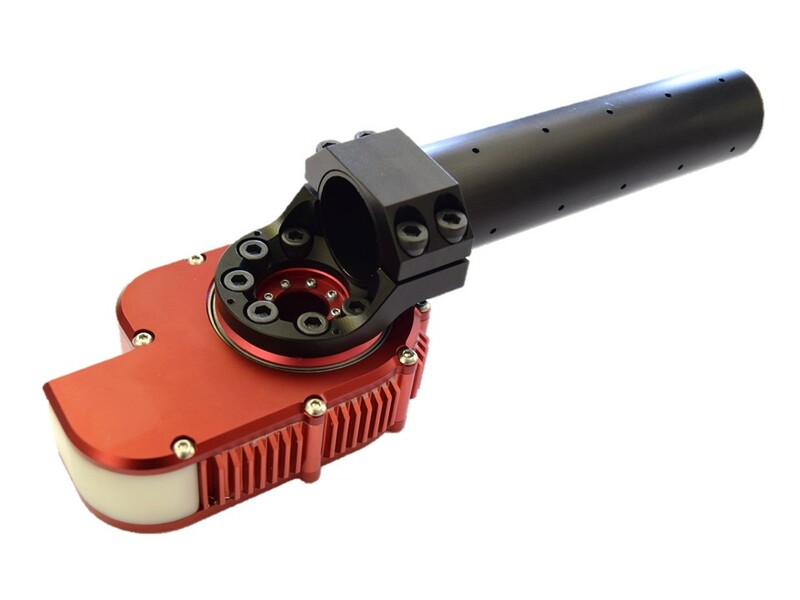 X-Series actuators were designed to simplify traditional wiring pain points and feature a through hole as well as a multi-port switch for daisy chaining. 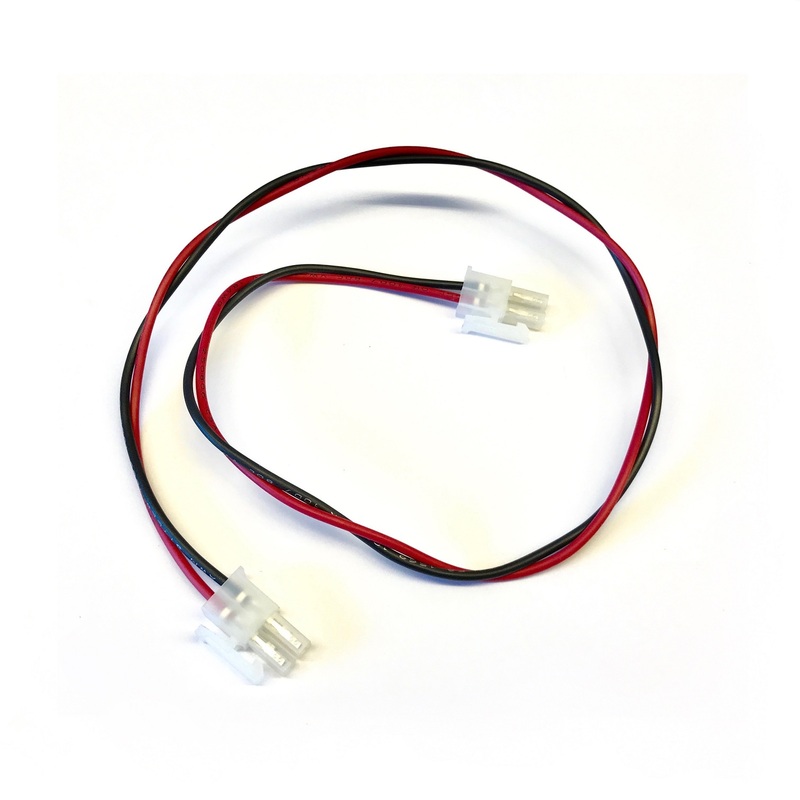 Additionally, we recommend using external power splitters to also daisy chain power wires. They can usually be hidden inside tubes such as shown in the image below. Wires that come from the previous joint should be inserted directly. Wires that connect to the next joint should be threaded through the hole. 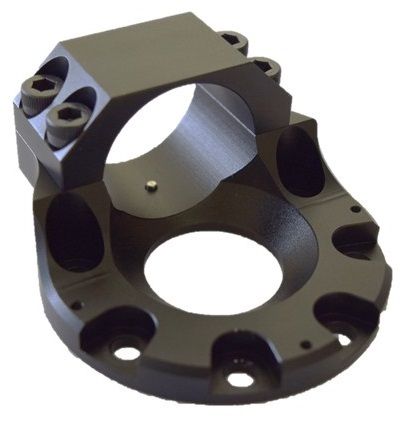 The T-slot adapter (A-2043-01) has an open side to allow for thru bore access. Try not to pinch wires in this configuration. Wires from a T-slot adapter should use the base module through bore. 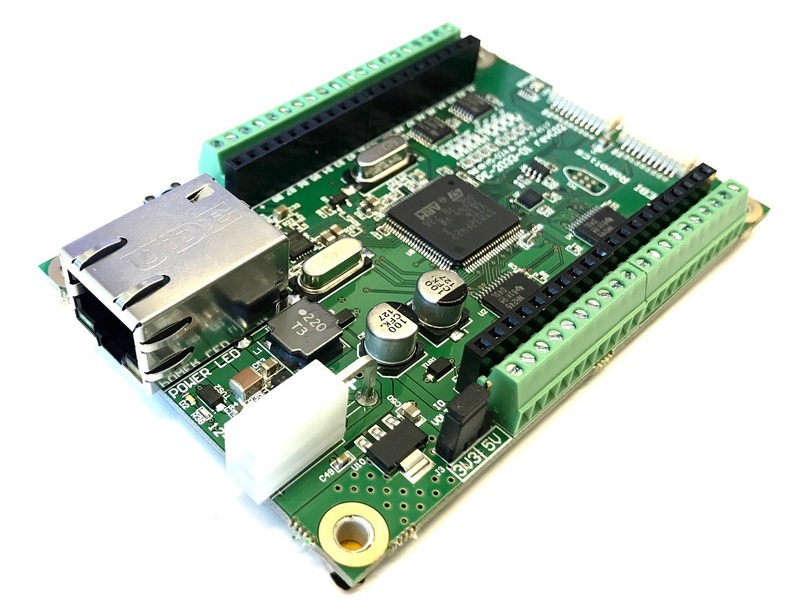 The HEBI I/O Board is an ethernet-enabled module that allows you to easily integrate various low-level sensors into HEBI’s APIs and framework. This module provides general-purpose analog and digital inputs, digital and PWM outputs, encoder inputs, and exposes in the various HEBI APIs in a way that is syncronized with any other modules on the network. 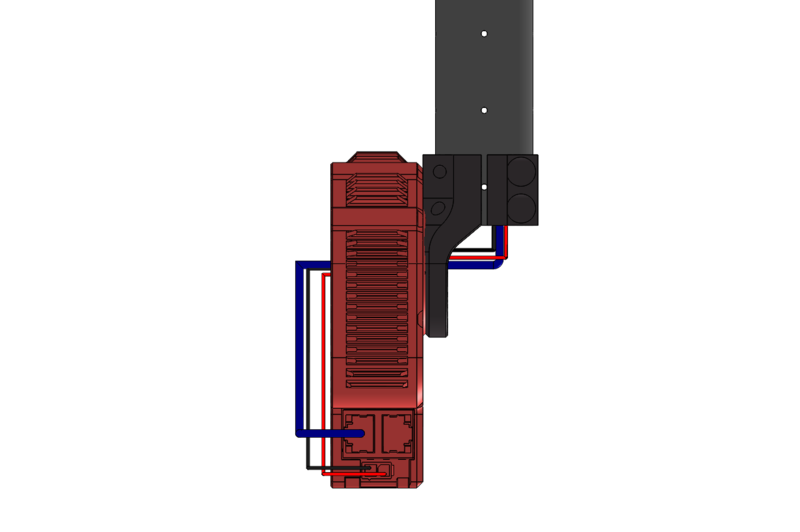 It also includes an IMU and on-board orientation estimate, using the same API format as the X-Series actuator. 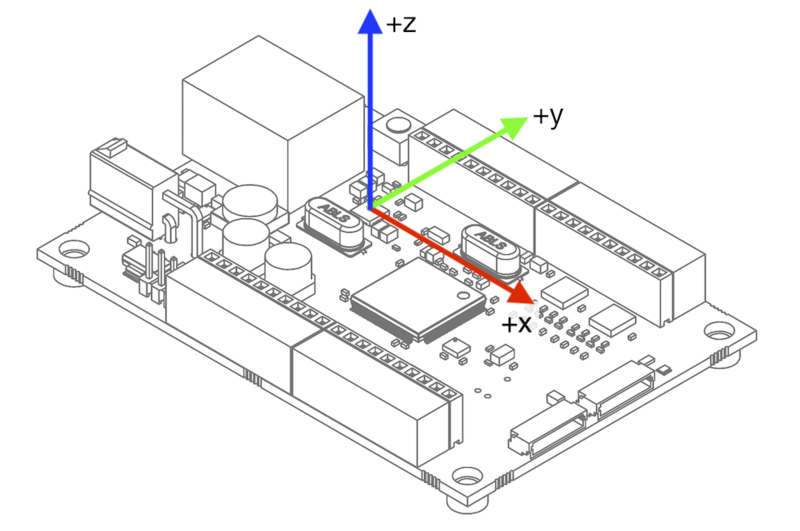 The reference frame for the I/O board’s IMU (accelerometer, gyro, orientation) is shown in the image below. The origin of the coordinate frame is shown centered on the IMU. A module’s sensed 3-DoF acceleration from an internal IMU, including gravity. Depending on the API, XYZ values are combined together into a single vector or returned individually. A module’s sensed 3-DoF angular velocity from an internal IMU. Depending on the API, XYZ values are combined together into a single vector or returned individually. RGB color values of the status LED. 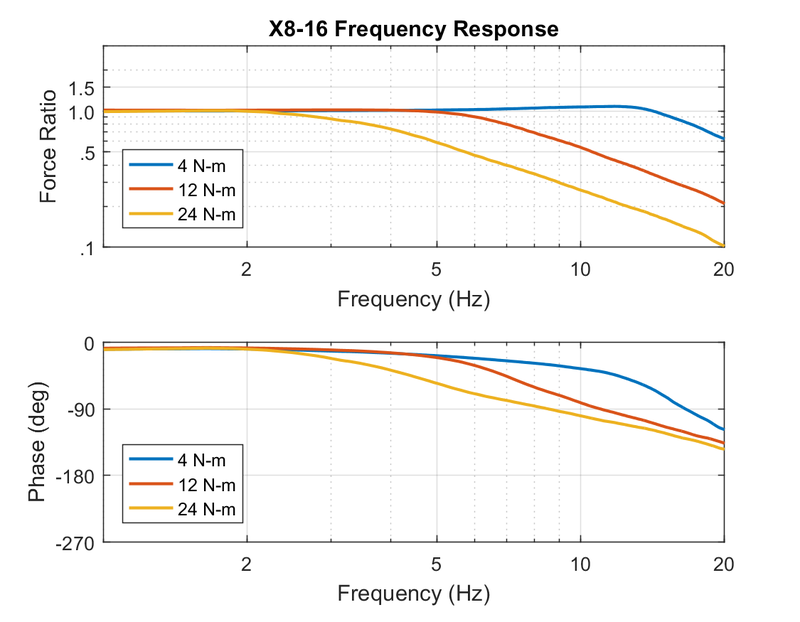 8 analog inputs, with a range of 0-5V. 8 digital inputs, which can handle either 3.3V or 5V levels. Quadrature encoder input. c1 and c2 will both report the incremental count (32 bits), starting at zero on boot. c3 is for an index pulse and is not currently implemented. Quadrature encoder input. c4 and c5 will both report the incremental count (32 bits), starting at zero on boot. C6 is for an index pulse and is not currently implemented. The currently commanded values on the 8 digital outputs. 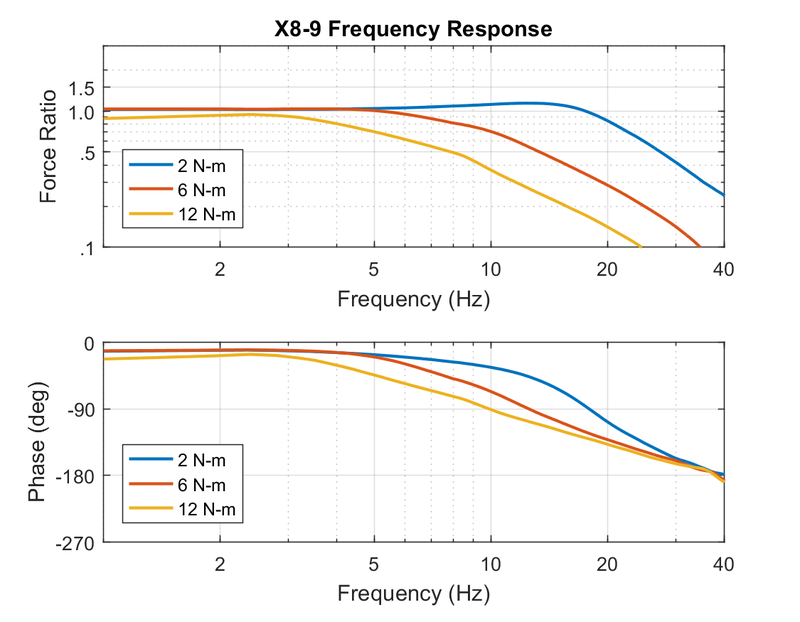 The currently commanded values on the 8 PWM outputs. 8 digital outputs, which can output either 3.3V or 5V levels. 8 PWM outputs, which can output either 3.3V or 5V levels. 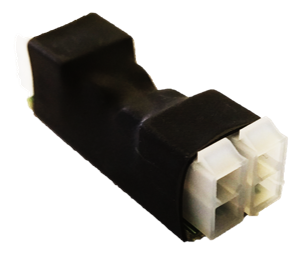 They are configured to switch at approximately 20kHz, which is appropriate for most DC motor control applications. In addition to commands related to I/O a number of other things can be commanded and/or set. 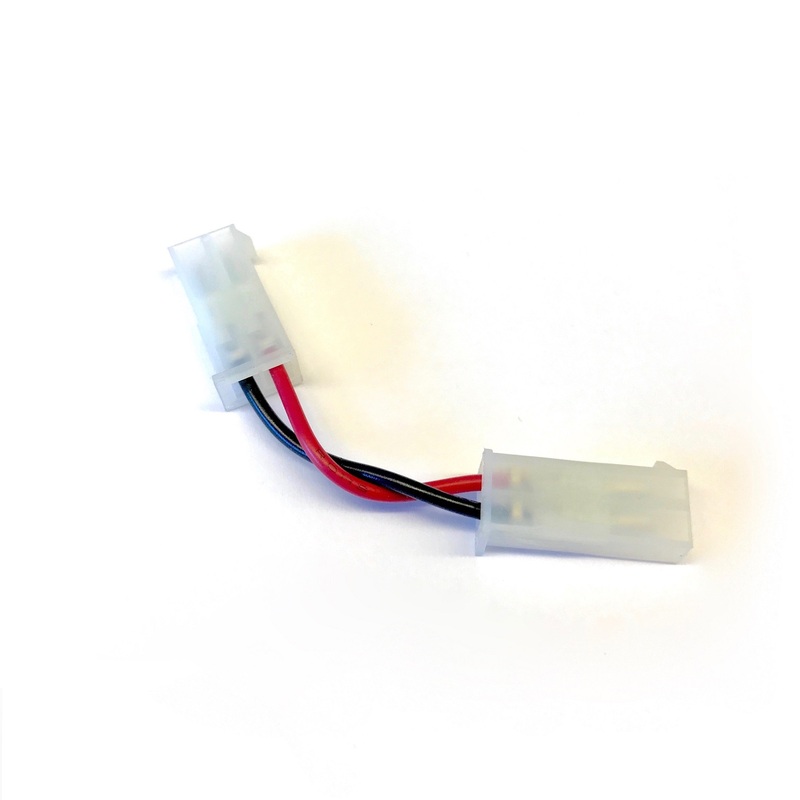 We offer a wide variety of accessories in order to help build and configure your robot with ease. If your application requires an accessory that is not listed below, HEBI can provide a quote custom development. 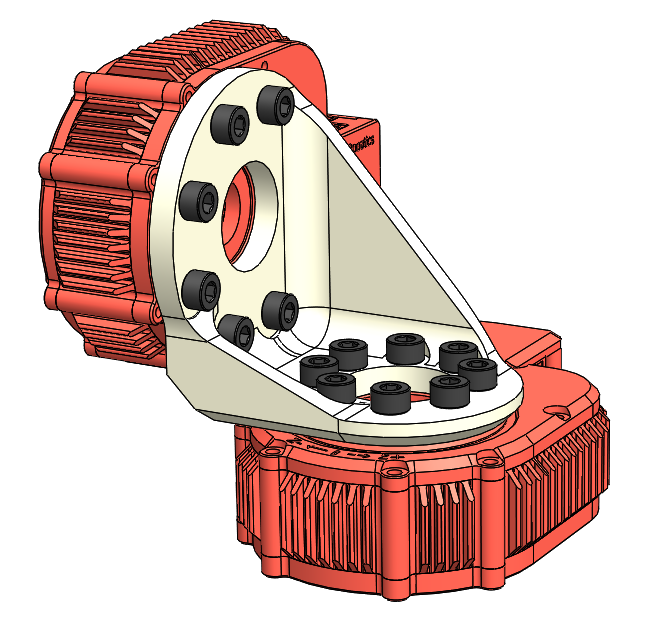 Additional drawings and CAD models can be accessed at cad.hebi.us. 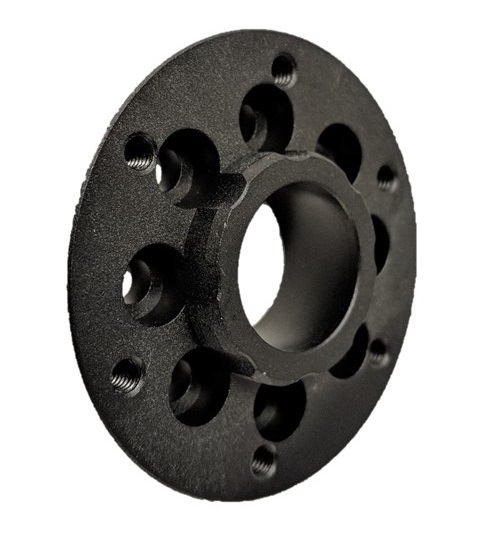 X5/X8-Series T-Slot Mount Plate 25mm/1"
Whenever feasible we try to make all HEBI components compatible with existing standards. While we do offer and sell all of the required parts, below are suggestions for some of the most common items that customers may want get from other sources. In addition to individual components, we have designed ready-to-go robotic systems we refer to as "kits". 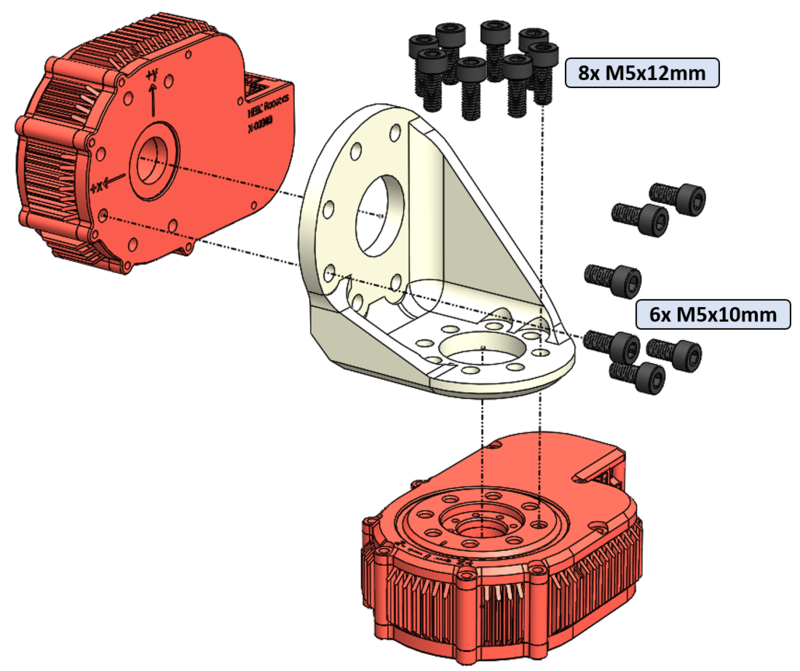 All kits include actuators, connecting accessories, wiring, assembly instructions, and example code. 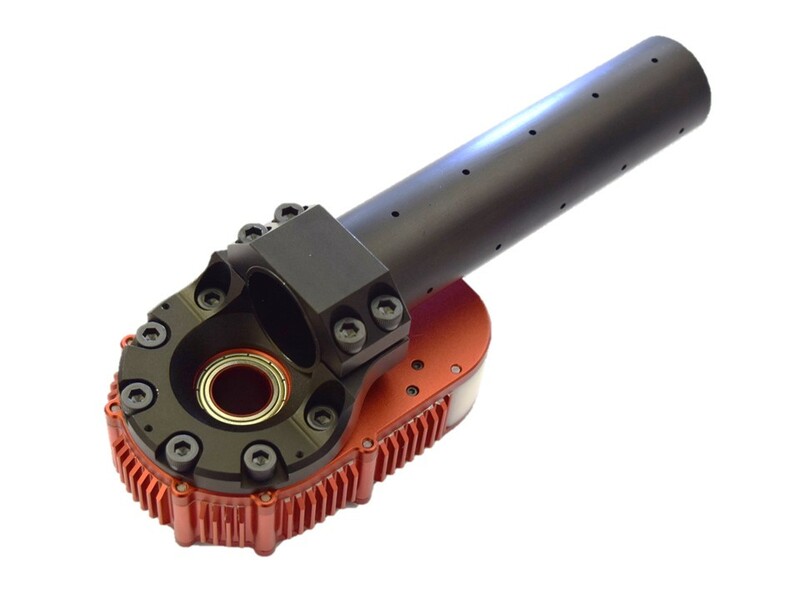 All kits have a suggested set of X-Series actuators. 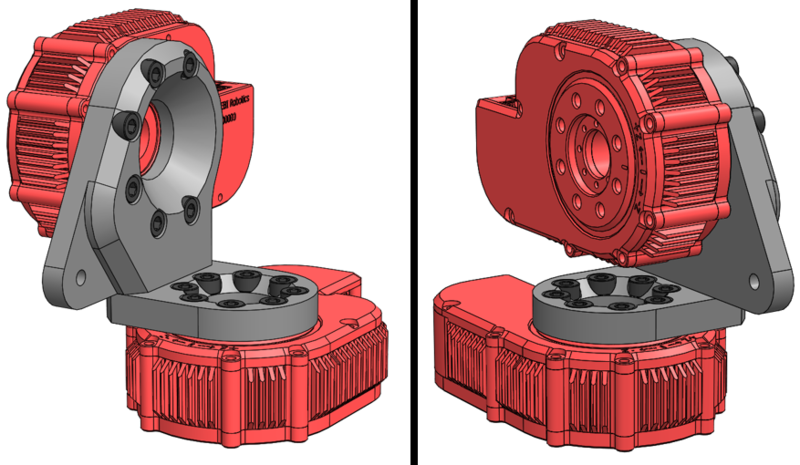 It is possible to adjust parameters such as payload or speed with a different configuration of actuators. A great starting point to build your own robotic system. HEBI actuators interface seemlessly with this chassis. 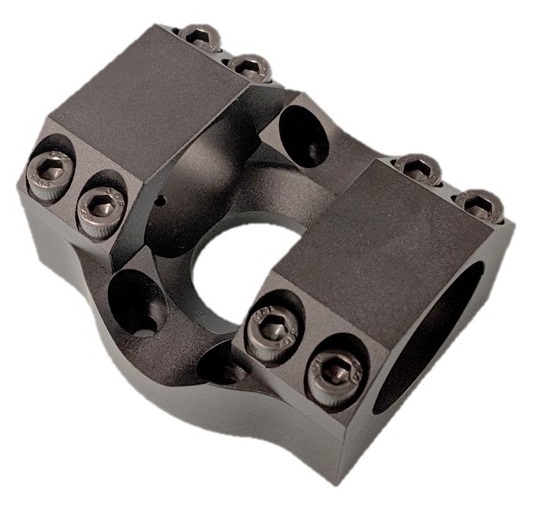 HEBI tubes and tube adapters are an easy way to create systems such as robotic arms. The indexing holes allow for precise length and twist measurements for your robot’s kinematics (see X5 Link in Kinematics section). 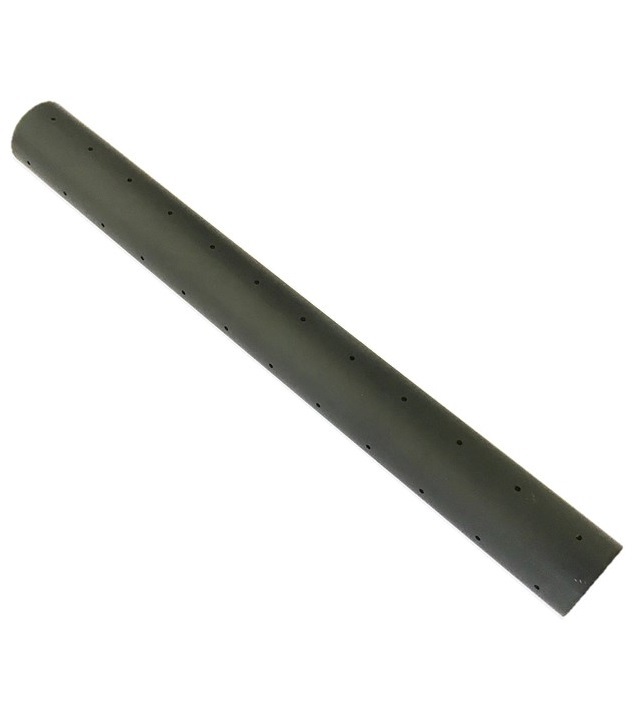 Our tubes come in standard lengths of 150mm, 300mm, and 500mm, but are easily cut down to custom lengths. Tubes were chosen for their lightweight and thru bore allowing for easy installation of wires (see Module Documentation). 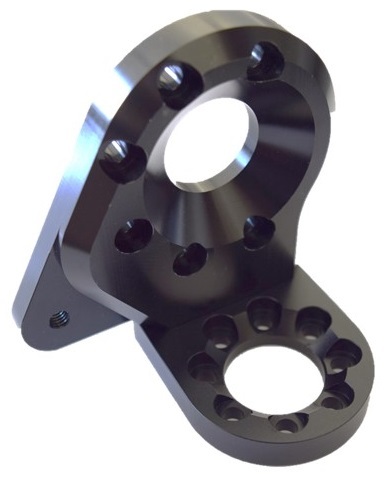 HEBI right angle brackets allow you to use X-Series actuators in perpendicular axes, commonly needed for bases or end effectors of robotic arms. 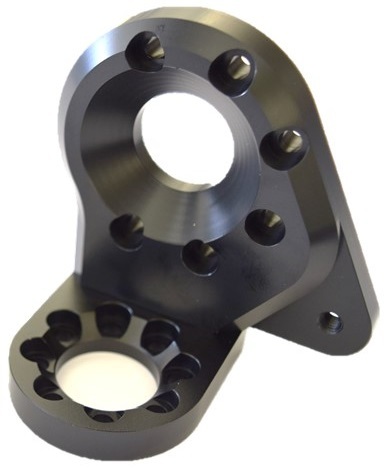 These brackets come in both a 'Left' and 'Right' configuration making it easy to setup your system specific to your application’s needs. 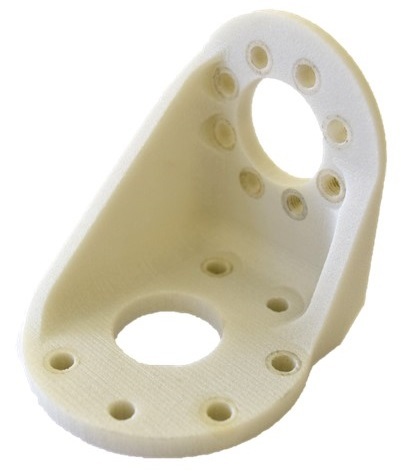 These brackets are 3D printed glass-filed nylon and are best for connecting end effectors to a final "wrist" degree of freedom on robotic arms. 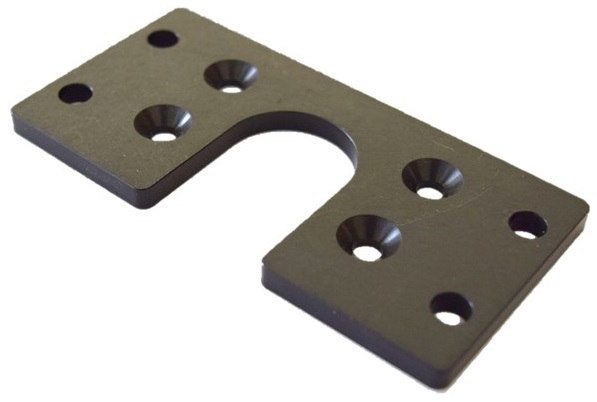 These brackets are black anodized aluminum and are best for bases of robotic arms. 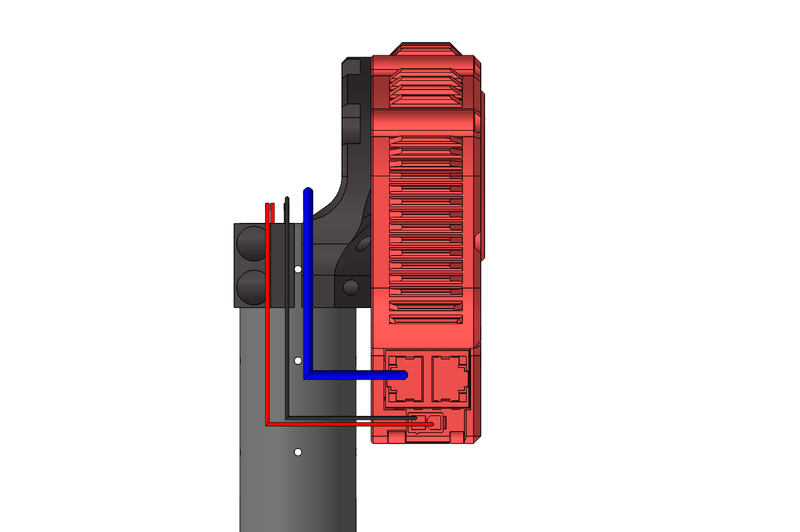 You can mount the vertical actuator in an 'inside' or 'outside' configuration as shown below. 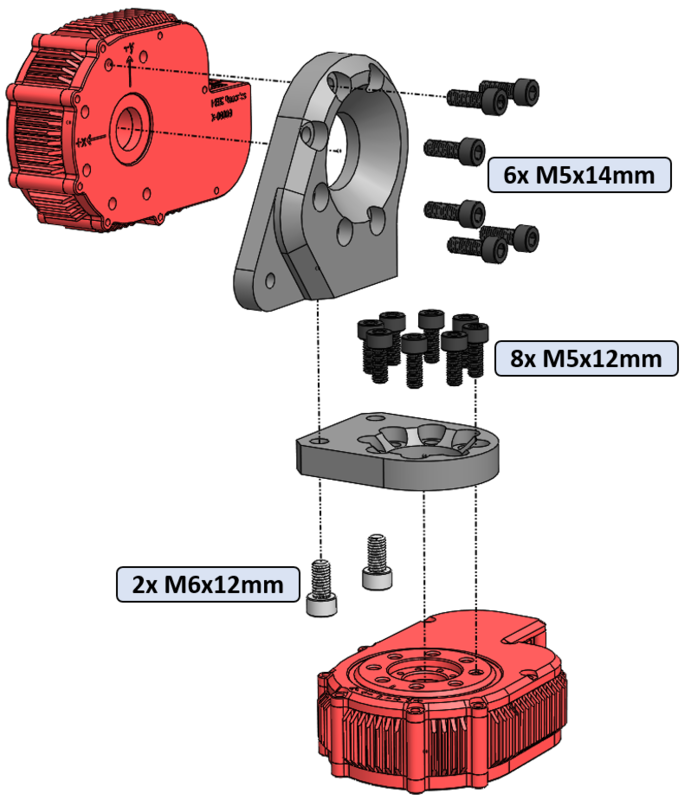 Need an easy solution for mounting your robotic system? 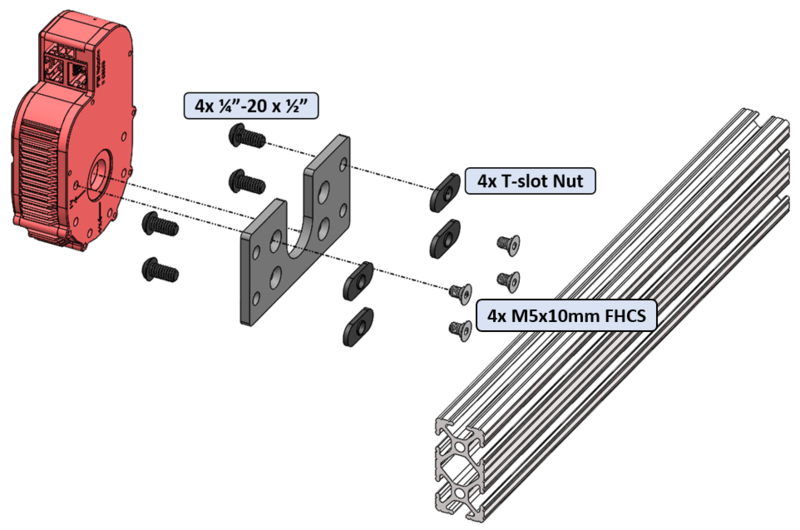 Enjoy building structures out of t-slot aluminum extrusion? The t-slot adapter is for you! This plate helps you attach any X-Series actuator to standard 25mm or 1 inch t-slot aluminum extrusion. There are no dedicated X8-Link or X8-Bracket parts. 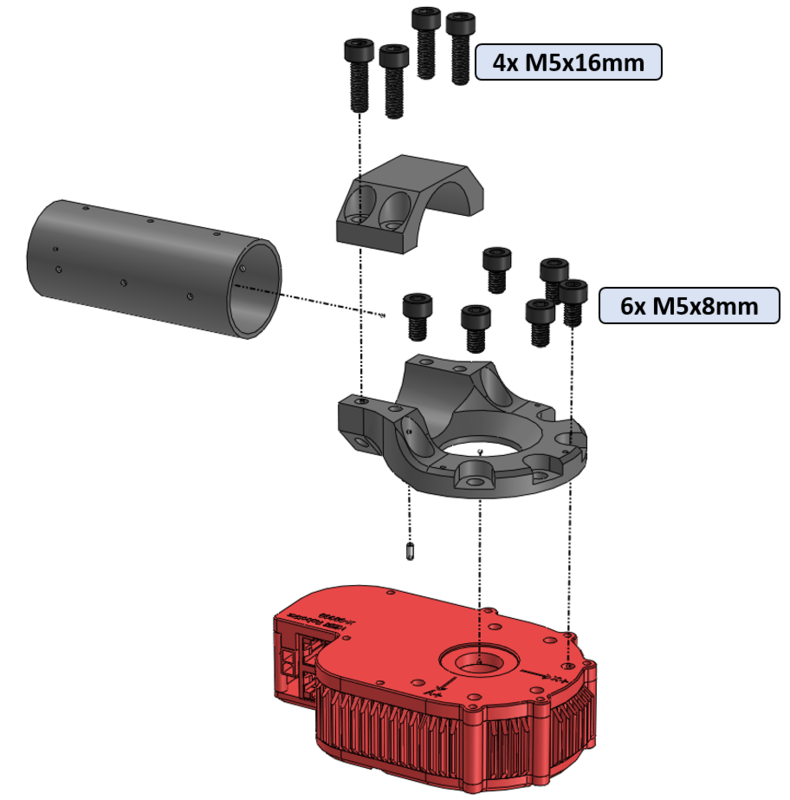 The housings of X5 and X8 actuators have the same input and output interface, so the X8 actuators are compatible with X5 connection parts. The X5 Link represents a straight extension that is typically used to connect two actuators. 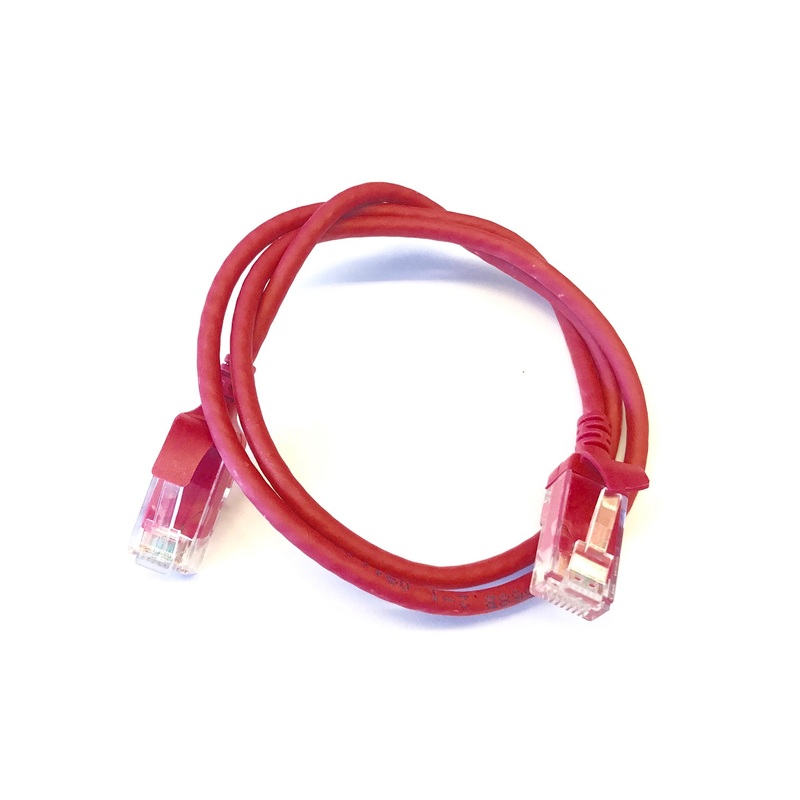 It consists of input and output adapters, as well as a hollow tube that cables can be wired through. It is defined by the extension length as well as the twist angle to the next output. Generic tubes: x + 0.025 where x is the distance between the outer-most tube parts. 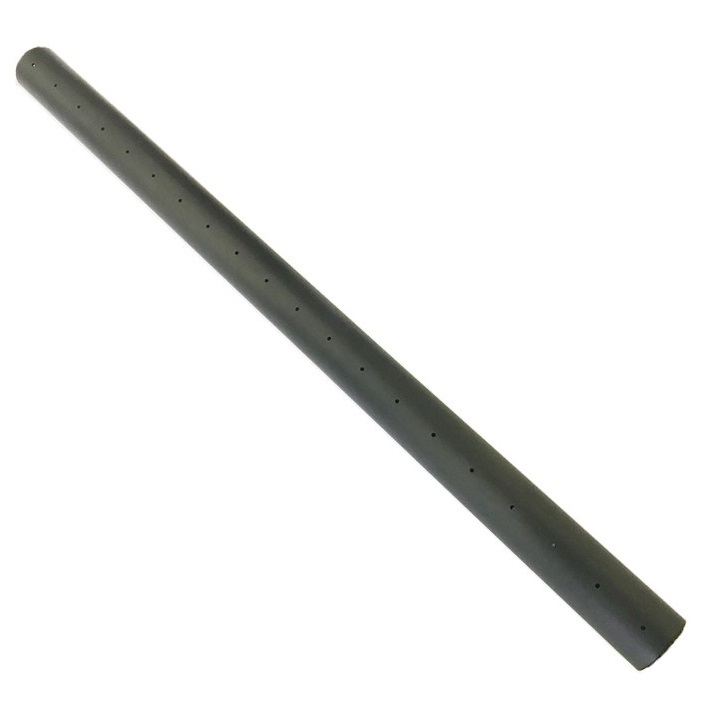 Indexed tubes: (N+1) * 0.025 where N is the total number of holes on the tube. 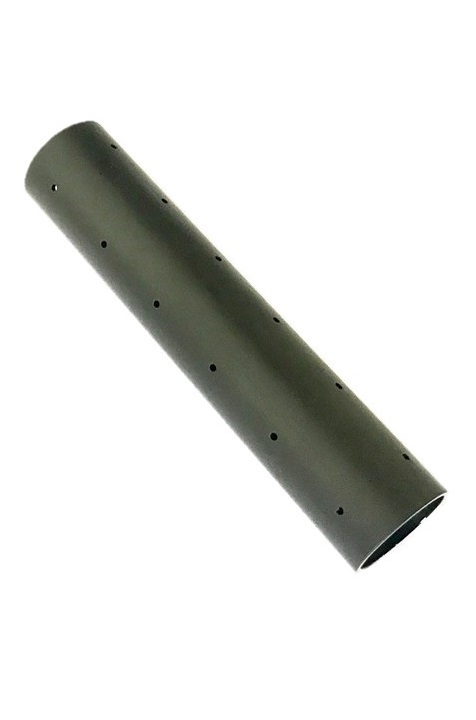 For example, a 300mm tube section has 12 holes, so the total distance would be 13 * 0.025 = 0.325m. Rotation about the X-axis (red axis in the above image). For example, the images above show a twist of PI radians. The examples below illustrate the possible variations for the Twist parameter in combination with a 300mm tube (extension=0.325m). 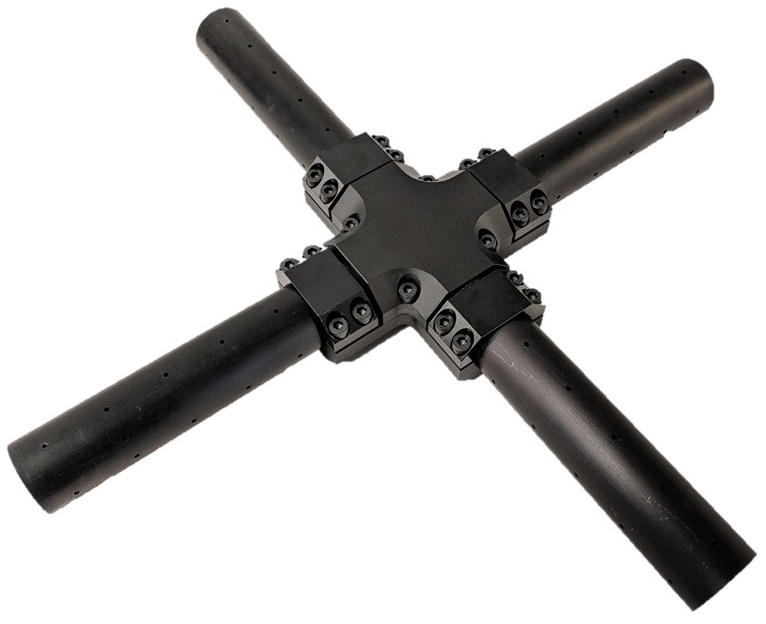 The X5 Light Bracket corresponds to a light-weight right-angle adapter that is typically used at the wrist of an arm. 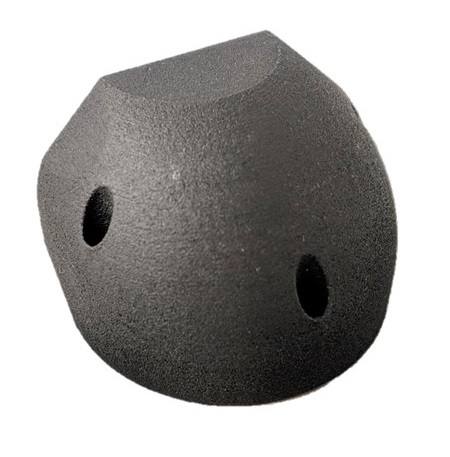 It has a single parameter that specifies the mounting direction. 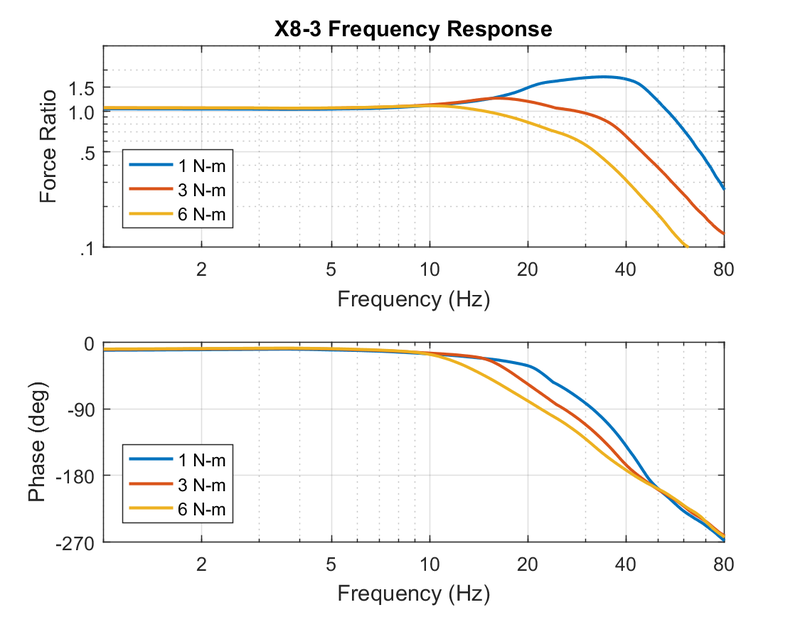 The direction of the output 'Z' axis (blue) pointing towards the next module, assuming that the 'X' axis (red) is pointing forward and the position is zero. Note that the left and right configurations are physically different parts, rather than the same part mounted in a different orientation. The below images show both mounting configurations at an output position of zero. 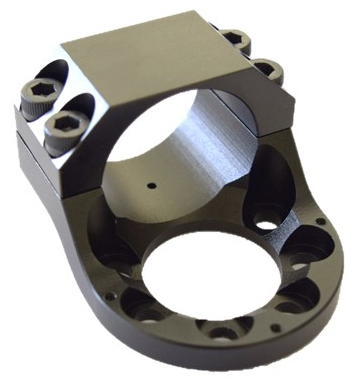 The X5 Heavy Bracket type corresponds to a sturdy right-angle adapter that is typically used at the base of a robot arm configuration. 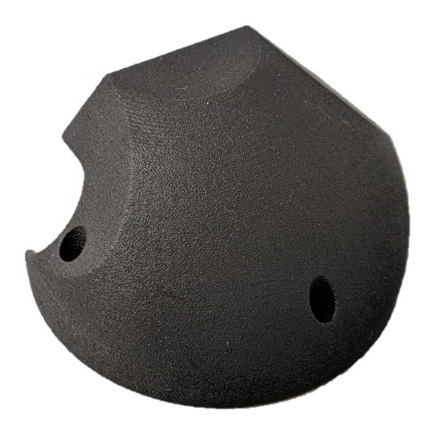 It has a single parameter that specifies the mounting direction. 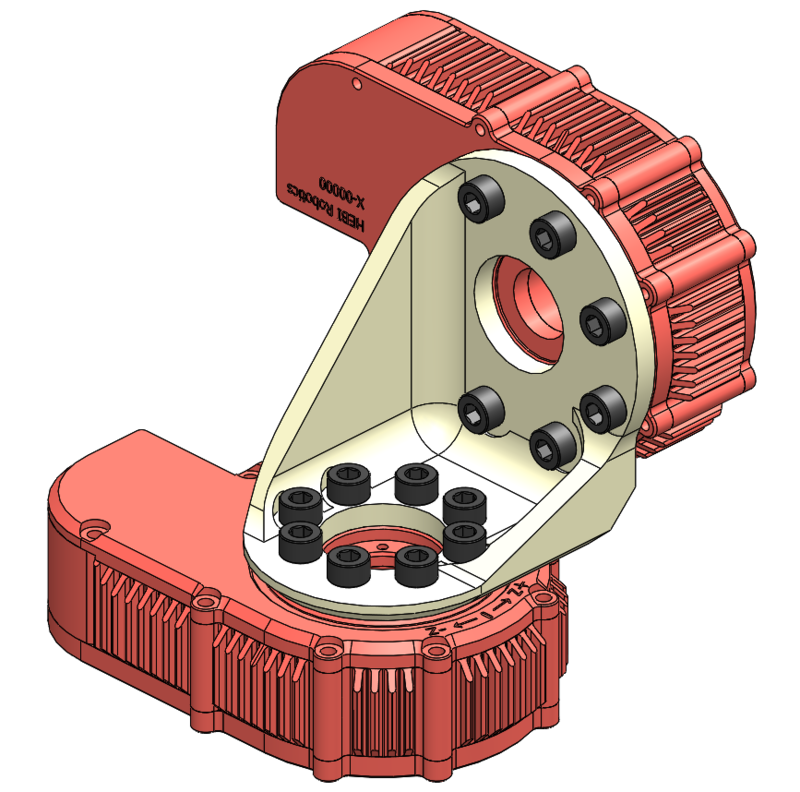 Due to the modular design of the bracket there are four different configurations. This parameter describes the output direction (same as the light bracket above) as well as the mounting side (closer or further away from the center). Note that the left vs right portion of the configurations are physically different parts, and the inside vs outside portion of the configuration describe the two different ways a given bracket can be assembled. The below images show the four possible mounting configurations at an output position of zero. Mounting = "left-outside" Mounting = "left-inside"
Mounting = "right-outside" Mounting = "right-inside"